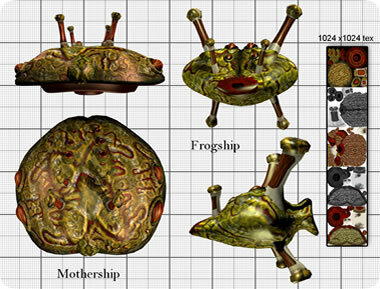 Template file to experiment with controls etc of ships etc. New dimensional rift technology has enabled the human race to expand to new territories. The Terran assault for raw materials and living space on Crixos I has commenced. Hey! The creepers don't really use it anyway and have rejected our pleas for peaceful exploitation. Woah hold it right there - I don't need to explain myself to you. Ah well… Just fire up the generators we're going to hold a garden party, our new neighbours are coming - and oh yes - The fireworks will be spectacular!!! Protect floating torus platforms that are gathering to create a planet enveloping shield allowing mining operations on surface to commence and human settling to begin. Player is in control of a hover gun-platform capable of shooting air to air shells as well as rockets / missiles. 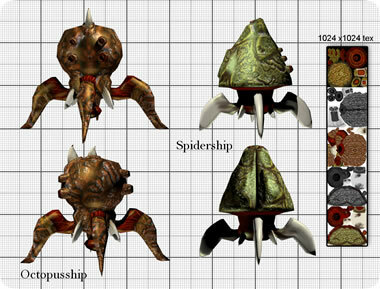 Enemy attackers come in big motherships that deliver attack forces which then swarm down in order to attack - These attackers drop TeslaBombs that act as giant coils sucking the energy right out of the plasma shields projected above each torus ship, they do this either by impacting directly into that plasma shields, or from below as they drill themselves into the ground, standing there like little spikes with energy radiating from the plasma shields to the rods. Once a Torus ship looses its plasma shield, the core generator is exposed and will go off with a bang. The torus ship will loose all propulsion means, leaving it to fall to the ground. Torus ships arrive one by one and gather to form a common shield interlocking their plasma shield spheres. The different ship types of our neighbours. http://einarpetersen.com/blendergames/terranassault/teslabomb.zip - Tesla bomb w/skin. Spins in a corkscrew motion as it drops and drills itself into the ground creating an electrical bridge like a continuous bolt of lightning with torus draining it of all energy. (could e expanded to other vehicles / structures) Once all energy is drained from it's target target becomes inert(differing behavior) and Tesla Coil explodes with all the energy it sucked up. http://einarpetersen.com/blendergames/terranassault/torus_n_plasma.zip - Torus shield platform w/skin and Shield platform with Tesla Shield Generator inside and with plasma shield - Skins and bump included. Alien ship explosions Terran ship explosions Small building fire Large building fire Terran building explosions Gunplatform going down fire plumes of smoke Torus going down Tesla Discharge to torus from ground Terran ground bomb explosion/burnmark Tesla Ground Device explosion http://www.positech.co.uk/content/explosion/explosiongenerator.html ??? Torus ship including some fire tests - collision tests etc. For this project I have been quite fortunate to run into a master craftsman when it comes to 3D Modelling - his name is Gustavo A. Ordoñez and he lives in Cordoba, Argentina. He is explaining a little about his involvement in this project at www.blogaqua.com.ar/search/label/Videojuegos - where he also has links to his teaching courses. He is currently working as a teacher, 3DFX artist etc. and a darn good one at that - I would definitely recommend him if you are in need of quick and to the point models go to http://www.freelancer.com/affiliates/einarpetersen/ and create your profile (please do not change url and sign up immediately as I will benefit from this) then create your project and invite flashcreativo to bid on your project. you will not regret your decision, you will get high quality work at a fair price from someone that puts an honour in delivering on time and according to specs. POC Terran Assault - tasklist - this was a list of early things for a potential collaborator to finish. Seeing the potential for Blender3D/Unity3D as an indie producer I wished to investigate a to me novel approach with regards to game development. 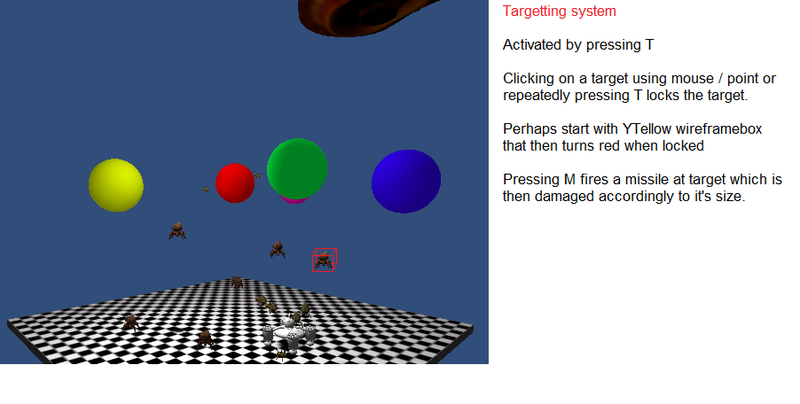 You will need imagination to be able to develop like this but in theory you could create game prototypes insanely fast (though this one due to multiple projects at the same time is going to take a tad longer) and to add injury to the list I am also learning to use the platform as well as been fending off repeated hacker assaults. The development idea was simply to create all gameplay first using simple geometric shapes, these shapes will then gradually be replaced with models, many of them are ready at this very moment as the production part has gone more swiftly than anticipated. The models were to be designed by freelance artists based on inspirational sketches and schematics given by me to them via http://www.freelancer.com/affiliates/einarpetersen/ - Please do not change the URL as it will benefit me in the future if you go in that way and immediately sign up that is should you wish to pursue this simple way of creating games and then putting “their proverbial digital robe on”. I am quite excited about this idea of purchasing the artwork from independent graphic artists and will be pursuing the same route when it comes to music background material as with effects. This way I hope to not just minimize production cost but also cut down radically on pruduction time - I also hope to be able to see the game simultanious on both Linux, Macintosh and Windows platforms… though Linux is the most important platform for me. Feel free to comment via this contact form as well as make donations using the donation buttons on the page. unity testfile - Platform can hover. unity 3'rd testfile - Platform can shoot and Mothership hovers above - colission detect. unity 4'th testfile - Mothership drops “proxy” ship objects. 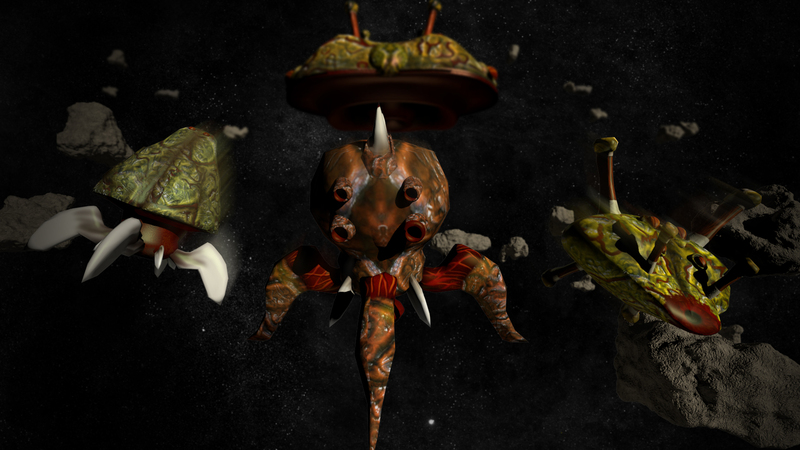 unity 5'th testfile - Now with actual ships swarming down. unity 6'th testfile - Now with plasma spheres, though color, impact and behavior needs to be adjusted. unity 7'th testfile - Now with plasma spheres transparent, vision beginning to properly take shape.